More about the Texas cultivators. The tillers come largely assembled in their box. Typically, you only need to install the rotors and assemble handlebars. Additionally, you must add oil and petrol. Usually, the machine can be up-and-running within half an hour. Extending the cultivator's working width. 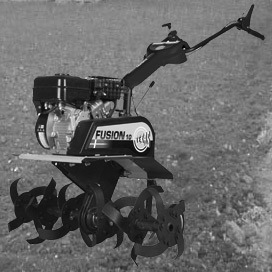 On many Texas tillers the rotor width can be expanded for faster rotavating of the area. Some models come with the extra rotors, on others they will be an optional extra. The beauty of being able to extend the working width is that the machine can be used in both small and large areas, making it very versatile. You'll find no other manufacturer of tillers, which offers such a wide range of accessories as Texas. 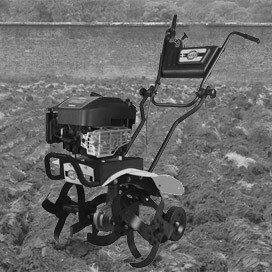 The accessories give your garden tiller extra features, and makes it useful for even more garden tasks. When you buy a Texas you have the option of removing moss from the lawn, hoe the ground, take up potatoes, scrape snow etc. Is it an advantage to have reverse gears? 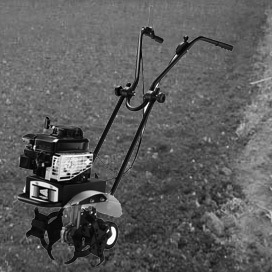 By choosing a model with reverse you get a slightly more useful garden cultivator. 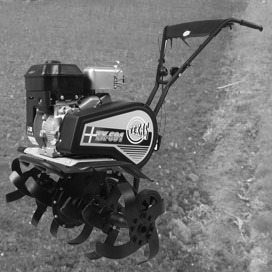 You can use it in conjunction with rotavating, if the ground is hard and it is difficult for the knives to get through the ground. Reverse gear can also be very good to have if you need to use the machine for other purposes than rotavating.